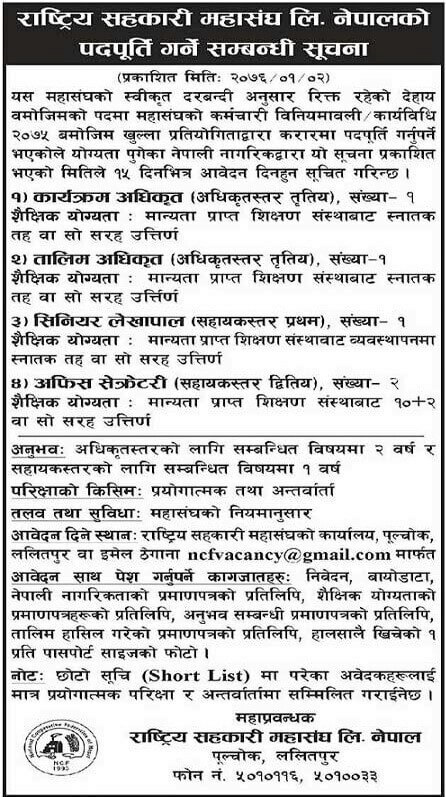 National Cooperative Federation of Nepal (NFC) published vacancy notice for various vacant positions. Qualified Nepalese citizens may apply for the given vacancy within 15 days from the date of this vacancy notice published. Qualification: Completed Bachelor’s Degree from a recognized academic institution or equivalent. Qualification: Completed Bachelor’s Degree in Management Degree from a recognized academic institution or equivalent. Qualification: Completed 10+2 from a recognized academic institution or equivalent. Submit application at National Cooperative Federation Office, Pulchwok or email at ncfvacancy@gmail.com.